Water is mentioned in the Holy Quran over 100 times, more than any other nutrient, air is the most essential compound for human survival followed by water. you can survive 10-14 days without food but only 3-5 days without water. It forms 83% of the blood. 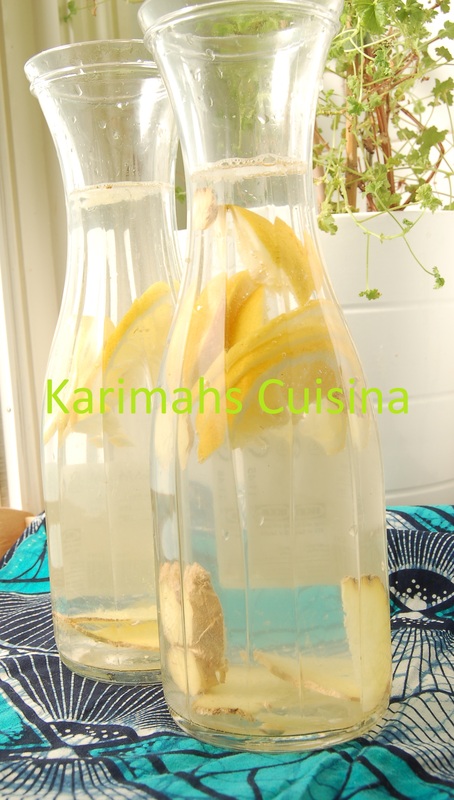 After a trip to Sistahintheraw we were reminded about infused water, a great way to drink water with a touch more flavour, this one has lemon and ginger; lemon although citric and acidic outside your body has an alkaline effect inside the body which is great and good for health, ginger, well we know that in paradise there will be a spring of ginger water, so you had better get used to it now, while you still have a chance to chose. Ginger has anti-inflammatory properties and aids digestion, nausea and gas in the stomach this would be an ideal drink for mothers with morning sickness, its subtle yet flavorsome mashallah, as the Creator would have it be.